Top collegiate governing body, made of public or private bodies which are members of the Platform. Its mission is to guide the PTFE and decide on its actions. Constituted by MINISTERIO DE CIENCIA E INNOVACIÓN, MINISTERIO DE FOMENTO, ADIF, CAF, CETREN, CIDAUT, CITEF, COMSA, ESM, FGC, GRUPO OHL, INECO TIFSA, INTRAS, METRO DE MADRID, PATENTES TALGO, FUNDACIÓN CAMINOS DE HIERRO, RAILGRUP, RENFE OPERADORA and FFE. Its mission is to coordinate and manage the Platform. Groups made up of companies and bodies, on the basis of their area of interest. 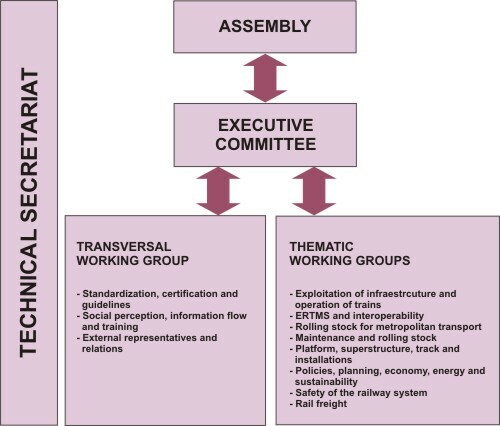 The Spanish Railways Foundation provides technical, organisational and administrative support to the PTFE.